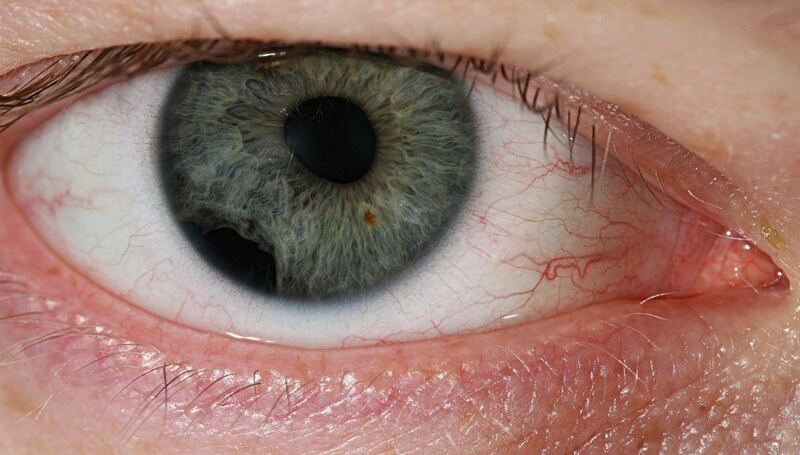 The cornea is the clear layer that covers the front of the eye, overlying the iris (the colored part of the eye). It has several different purposes. First, it protects the eye, particularly the iris and the lens which sits just behind the iris. Second, it aids in the refraction of light reaching the eye. Third, it filters out some of the UV light from the sun to protect the light-sensitive retina deep inside the eye. The cornea has no blood supply but is innervated by a branch of the trigeminal nerve and part of the oculomotor nerve. Corneal abrasions are relatively common. A corneal abrasion can be a simple scratch to the eye or it can be a foreign body imbedded in the tissue of the cornea. About 3 percent of all visits to family practitioners in the US are due to corneal abrasions. Many of them are work-related and due to a lack of adequate eye protection in the workplace. Others are due to random trauma to the eye in which a sharp object impacts the tissue of the cornea, resulting in a scratch or imbedded foreign body in the corneal tissue. Corneal abrasions are very painful. A person with a corneal abrasion will feel as though there is a foreign body in the eye but, unlike a foreign body, the pain stays in one place and is usually located in the upper outer quadrant of the eye itself. Patients with a corneal abrasion often keep their affected eye closed and have extreme light sensitivity when the eye is opened. Any kind of movement of the eye, whether it is closed or open, makes the pain worse. Vision is often blurry and there is much tearing of the affected eye. Patients with a corneal abrasion give a history of having come in contact with a sharp object or blunt trauma to the eye. Some will give a history of working in a place where a metallic foreign body may have gotten into the eye. Some metallic foreign bodies will imbed into the corneal tissue and the metal will leach out of the foreign body and stain the cornea on examination. Others will give a history of a motor vehicle accident in which the eye was exposed to shards of glass from a broken windshield or other automobile window. In order to properly examine an eye that may have sustained a corneal abrasion a drop or two of a topical anesthetic is applied to the opened eye. Typical topical anesthetics include proparacaine or tetracaine. Sometimes a dilating agent is instilled in the eye, which serves to decrease the pain in the eye. Topical anesthetics can retard wound healing so only a drop or two should be instilled into the eye. The eye is carefully examined under a microscope or with the native eye. The eyelids are retracted to see the entire cornea and the eyelids are flipped in order to look for the possibility of a retained foreign body in the eye. If there is any evidence of an actual injury to the globe of the eye (a rupture of the globe), the eye should be patched with a metal or plastic shield and the patient should be referred urgently to an ophthalmologist. A drop of fluorescein is instilled in the eye. This is a yellow dye that will stain any corneal abrasion a yellow-green color when exposed to a black light. The scratch ca be visualized under a microscope or with careful inspection after shining the black light onto the affected eye. Foreign bodies can be seen as a circular ring of fluorescein. If a metallic foreign body has leached metal into the cornea, this can be seen as a discolored part of the cornea around the foreign body. All patients with a corneal abrasion should be up to date on their tetanus vaccination or they must receive a tetanus vaccination at the time of their abrasion along with tetanus immunoglobulin if not protected by a prior tetanus shot. Cases of tetanus from a corneal abrasion can occur, although it is a rare occurrence. Any corneal abrasion that occurred as a result of dirt or other organic material should be considered prone to tetanus and prophylaxis against tetanus should be given. If the corneal abrasion was due to a metallic object, the risk of tetanus is less. A dirty wound need a tetanus shot within 5 years; a clean wound needs a tetanus shot within 10 years. Historically, eyes affected by a corneal abrasion were patched with the idea that a patch will result in less pain and greater healing. In recent years, however, it has been shown that patching the eye offers no specific benefit to healing and it results in a loss of ability to perceive depth. This sets the patient up to additional injury from an inability to see properly. Many studies have shown that patching the eye did not change the rate of healing of a corneal abrasion. Now patching the eye is completely optional and is done only for the patient’s comfort if they should choose to have one. There is no difference in perceived pain when a patch is applied versus keeping the eye unpatched. In fact, most patients experience more pain with a patch than without. Topical antibiotics are often used as part of treatment of corneal abrasions, even though there isn’t a great deal of evidence to support their helpfulness in promoting healing of the corneal abrasion. One study looked at the use of chloramphenicol ointment in the treatment of corneal abrasions and found that it reduced the incidence of secondary corneal ulcerations. The study did not, however, use a placebo to control the study. The use of antibiotic drops for prevention of infection is currently left up to the decision of the treating physician. Ointments are preferred to using antibiotic eye drops if the decision is made to use a topical antibiotic. This is because ointments can keep the cornea well lubricated, which can reduce pain and promote healing. Common ointments used include sulfacetamide ointment or erythromycin ointment, applied four times daily for up to five days. By then the corneal abrasion should have completely healed. Ongoing anesthetic drops, while they would control the pain, are not recommended for long term use in the treatment of corneal abrasions. Anesthetic drops, as mentioned, can retard the healing of the abrasion and set the patient up to have an anesthetize eye that may be of risk of another injury that wouldn’t be noticed if the patient had access to ongoing eye anesthesia. People with contact lenses put themselves at risk of getting an infection with pseudomonas if they receive antibiotic ointment or drops. These individuals should be told to refrain from using contact lenses until the corneal abrasion has resolved by means of a clear re-evaluation. If the cornea has ulcerated, it should be treated with topical antibiotics. One should not make the assumption that the cornea is just scratched and should thoroughly evaluate the eye for the presence of a foreign body loose or imbedded in the eye. If the person was working grinding metal, for example, a piece of the metal could have struck the eye and might be imbedded in the cornea. If the foreign body is loose, it can be removed by irrigating the eye with saline or taking up the foreign material with a cotton swab. If the foreign body is imbedded but does not appear to have perforated the cornea, it can be removed with a 25-gauge needle. Any metallic staining can also be removed by gently scraping it off the corneal tissue until there is no discoloration around the impact site. If the foreign body cannot be removed, the patient should be evaluated by an ophthalmologist, preferably within 24 hours. If the abrasion was due to a contact lens, the lens should not be worn and the patient should have a topical antimicrobial agent given because they have a greater chance of developing an infected corneal ulcer. There should be adequate antibiotic coverage for pseudomonas with agents such as topical gentamycin, norfloxacin, ciprofloxacin, or tobramycin. Drops are easier to use than ointments; however, they must be instilled in the eye every 2-3 hours. Ointments cause blurring of the vision but don’t have to be instilled into the eye as often (about every 4-6 hours). Neomycin ointment should be avoided because many people are allergic to this type of ointment. Pain relief can involve using topical NSAID (nonsteroidal anti-inflammatory medication) therapy. Patients who use these agents return to work faster when these types of drops are used. Common topical NSAIDs include ketorolac or diclofenac drops. Another option is to use the drops along with a soft disposable contact lens to ease the pain while maintaining the ability to see out of the affected eye as it heals. Narcotic pain relievers are also an option for pain relief. This includes medication such as Percocet (acetaminophen and oxycodone) or Tylenol #3 (acetaminophen and codeine). These can be used along with the topical medications to ease the pain until the corneal abrasion heals. Using mydriatic agents to the affected eye can relieve ciliary muscle spasm and can reduce the pain associated with a corneal abrasion. A long-acting cycloplegic agent can be used to reduce pain and relieve light intolerance. The patient having sustained a corneal abrasion should be re-evaluated by an ophthalmologist in 24-48 hours post injury. This is to see if proper healing has occurred and that there is no evidence of infection. Most corneal abrasions heal very quickly—with 24 hours after the injury and the healing usually leaves behind no evidence of the abrasion. Patients who wear contacts that caused the abrasion should be seen about 3-5 days after the injury to make sure there is no infection and to make sure that the patient can resume wearing a contact lens on the affected eye. In the meantime, the patient should avoid using the eye for reading and shouldn’t move the eye very much. Light should be avoided if there is a great deal of photophobia. A cycloplegic agent should be used twice daily for abrasions that are very large or in patients who have photophobia. This helps prevent blepharospasm. I’m Ed Smith, a Sacramento personal injury attorney who has handled many eye injury cases since 1982. Call me anytime at 916.921.6400 for free, friendly advice.